What better way to navigate this cardboard existence than in a cardboard vessel? The task was to design a visual identity and visuals for the fictional firm B&B that uses a secondhand circus van as transportation. The van was our main character in the production of the opening animation, corresponding jingles, and credits. The visual identity reflects the awkwardness of the main characters. Their world is a mixture of old-fashioned styles, used things, and charming bad taste. As they are in the smuggling business, we set the stage as if they are living in cluttered cardboard boxes. The lyrics of the title song were our main guide. 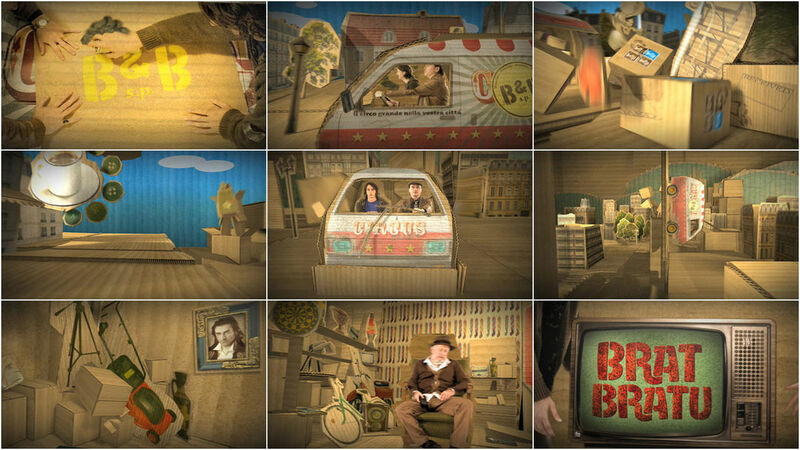 All the props mentioned in the song were used as clutter in this unidentified 3D world that the characters drive through just to get home, to turn on the TV, and start the show. We used 2D photos of all the props, built a 3D city out of cardboard texture, and shot the main characters in stop motion. All of that was constructed, designed, and lit in the 3D program Maya, and at the end composited into the final animation using Shake. Michel Gondry's inspired single take video.